THURSDAY, Sept. 11, 2014 (HealthDay News) -- Using a new ultra-sensitive test, Johns Hopkins researchers found that people with diabetes may have a sixfold higher risk of heart failure even if their cholesterol is low and they appear otherwise healthy. Results of the new study suggest that people with diabetes and pre-diabetes may be suffering undetectable -- but potentially dangerous -- heart muscle damage, the researchers concluded. This heart damage is occurring regardless of a diabetic's cholesterol levels, which had no effect on test results, said lead author Elizabeth Selvin. She co-director of the Cardiovascular Epidemiology Training Program at the Johns Hopkins Bloomberg School of Public Health. "Even if we treat people with diabetes with statins, we may not be able to fully address the increased risk of death and heart failure in that population," Selvin said. "This underscores the need for prevention of diabetes and pre-diabetes." The study relied on an ultra-sensitive test designed to detect minute levels of troponin, a protein released into the blood when heart cells die. Emergency room physicians already look at troponin levels to help determine whether a new patient is suffering a heart attack, Selvin said. 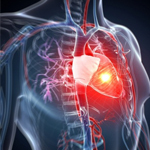 During a heart attack, the heart's cells leak large amounts of troponin into the bloodstream. The test used in this study is 10 times more sensitive than the ER blood test, and can detect evidence of chronic heart muscle damage even in people who show no signs of heart disease or illness, according to the study authors. The highly sensitive troponin test is not yet approved by the U.S. Food and Drug Administration, but could wind up being a useful tool for physicians to identify patients who are suffering chronic but undetectable heart muscle damage, Selvin said. "Our findings suggest that this test may be helpful to identify people with early heart damage," she said, adding that it eventually could stand alongside cholesterol tests as a standard screening tool for heart disease risk. For this new report, Johns Hopkins researchers looked for minute amounts of troponin in more than 9,300 people enrolled in a long-term heart risk study. None of the participants had any signs of heart disease. Still, about half of the people had trace amounts of troponin in their bloodstream, an indication that their heart muscle is suffering unseen damage. The researchers found that people with diabetes were more than twice as likely to have elevated trace amounts of troponin in their bloodstream than people without diabetes. People with pre-diabetes were about one-third more likely to have higher traces of troponin in their blood, according to the study. Diabetics with elevated trace amounts of troponin in their blood were six times more likely to develop heart failure and almost four times more likely to develop heart disease, compared to people without diabetes or traces of troponin, the study reported. The findings were recently published online in the journal Circulation. The fact that some people with pre-diabetes appear to be suffering undetected heart damage should be noted by cardiologists and primary care physicians, said Dr. Robert Eckel, a professor of medicine at the University of Colorado Anschutz Medical Campus and a spokesman for the American Heart Association. "This might be evidence to indicate that even before people get diabetes, the likelihood of having some damage that affects the heart could be there, and these people should be treated more aggressively," Eckel said. Eckel said this new test, which looks for "high-sensitivity cardiac troponin T," could prove a useful tool for detecting and treating early heart disease, if follow-up studies verify its effectiveness. The test also may prove useful in the emergency room. In March, a Swedish study reported that the test can help predict the heart attack risk of patients experiencing chest pain. However, both Selvin and Eckel noted that it's not yet clear why diabetes is damaging the heart muscle, so doctors remain at a loss what to do to prevent the chronic low-level heart damage this test now allows them to detect. "Even though this is a marker for some bad things happening, this result doesn't give us any idea how we might want to treat this differently," Eckel said.